In its efforts to tackle banking crisis and avoid a bailout, Slovenia is now facing a crisis of democracy. In recent months, many commentators have turned their attention towards Slovenia, with some predicting that the country may soon need to request a bailout from the ‘Troika’. With this in mind, Slovenia’s government has moved to push through a package of tax increases, public sector pay cuts, privatisations and bank reforms. Nicole Lindstrom argues that while the government’s reform agenda may have forestalled a bailout, many Slovenes feel that it has been done in a way that undermines the country’s democracy. Following on the heels of Cyprus, observers fear that Slovenia will soon become the sixth Eurozone member to seek a financial bailout. For a country that was heralded as a success story among post-socialist new member states, this signifies a remarkable fall from grace. When Slovenia was the first post-socialist state to adopt the euro in 2007, it enjoyed the highest GDP amongst its neighbours and one of the lowest ratios of public debt in Europe. Today, with Slovenian state-owned banks holding some seven billion euros in bad loans, recapitalization expenditures have pushed Slovenia’s budget deficit and public debt levels well over Eurozone thresholds. While the proposed measures have appeased the Troika for now, Brutusek faces significant opposition to the plans at home. Slovenia is unique among post-socialist states in having kept many of its economic assets in domestic hands, including its banks, and preserving a strong social welfare state. Some observers argue that the state’s ‘stranglehold over the economy’ is responsible for the crisis, and celebrate the government’s proposed reform measures as long overdue. Yet critics say that Slovenia’s financial troubles are due to a banking crisis exposing rampant cronyism. 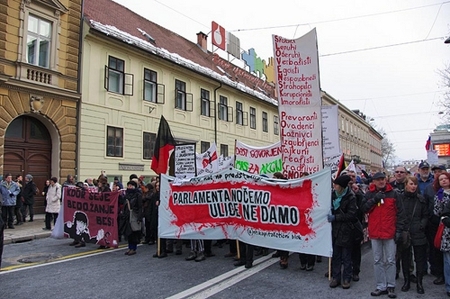 In mass demonstrations across Slovenia over the last six months, protesters declare: ‘We will not pay for your crisis!’ With the Parliament giving the go ahead for the first round of privatization deals this week, it appears the centre-left coalition is giving Bratusek time. But with confidence in political leaders at an all-time low, as Slavoj Žižek suggests, the crisis is one of democracy as much as finance. Slovenia is notable for being the only post-socialist EU member state to keep a majority of its banks in domestic hands. Advocates of the policy long argued it would make Slovenia less vulnerable to global financial shocks. This has been far from the case in the most recent crisis. In the boom period between 2005 and 2008, Slovenian banks engaged in extensive cross-country borrowing, to the tune of £12 billion. A steady stream of cheap credit flowing through Europe prior to the 2008 crisis encouraged banks like NLB to essentially give away money ‘for free’. Like in other new member states, much of this money fuelled a real-estate, construction and stock market boom. But in Slovenia, it also went towards what Slovenians call ‘tycoon loans’. In short, banks lent money under very favourable terms to Slovenian business insiders who, in turn, used the money to consolidate their ownership of firms. The global financial crisis hit Slovenia hard, its GDP falling by 8% in 2009. Domestic firms faced sharp decline in sales when housing bubbles burst. With the easy flow of credit now reduced to a trickle, banks were no longer able to roll over loans through inter-bank borrowing. Unable to pay existing loans, the ‘tycoons’ borrowed more. 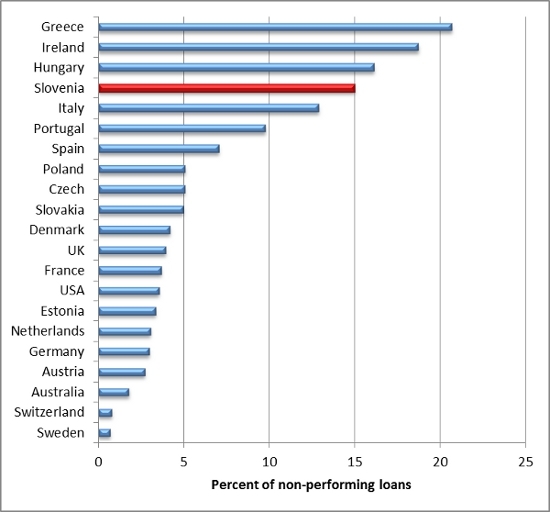 But by 2012, with Slovenia’s economy at a standstill, nearly 15% of loans were non-performing. As shown in Figure One below, this puts Slovenia just below Greece, Ireland and Hungary. It is worth noting, however, that Slovenia’s banking system is relatively small by European standards, with a ratio- of around 180% of banking assets to GDP, compared to, for example, 700% in Cyprus. To save its ailing banks, the government has provided repeated capital injections, deposit guarantees, and continued liquidity through bond issues – contributing to the rise in Slovenia’s public debt from 22% of GDP in 2008 to an estimated 71% in 2014. The creation of a ‘bad bank’ to take non-performing loans off bank balance sheets has been among the most controversial interventions. Praised by the IMF and OECD, but condemned at home, critics argue that the bad bank bails out tycoons at the expense of the taxpayer, and gives immunity to those responsible for the bad deals. When the parliament agreed to back a referendum on the bad bank in November last year, campaigners had little trouble collecting the 40,000 signatures required. But in December 2012 the Slovenian constitutional court ruled the referendum unconstitutional. The OECD praised the decision, arguing that ‘the political economy of reform remains difficult, notably because it has been easy to use a referendum to veto a law’. Indeed, when the left-leaning Pahor government proposed a rise in the retirement age in 2011, Slovenians rejected the initiative 72% to 28%. But the decision only fuelled a sense of anger that the government was suppressing democracy to appease international financial institutions and investors. Many Slovenians consider the government’s plans a ‘catastroika’ for Slovenia. Recent parliamentary decisions point towards this government’s resolve to push the package through. In addition to giving privatization plans a green light in June, at the end of May Slovenia’s parliament agreed, 78-8, to modify the constitution to require a balanced budget – a measure that Bratusek had publicly opposed as a Finance Ministry official. Facing accusations that the government is caving under outside pressure, Bratusek argued that ‘We are doing this for ourselves’. But the societal cohesiveness, or a strong sense of ‘ourselves’, which played a large part in sustaining Slovenia’s gradual path of transition has been steadily eroding. Recent demonstrations in Slovenia indicate that Slovenians share the sentiment expressed from Athens to Istanbul to San Paulo that the ‘current practice of democracy isn’t working for them.’ A recent occupation of the largest state-owned bank in Ljubljana, under the banner ‘No one represents us!, is just one sign of new forms of politics emerging in the face of crisis. Nicole Lindstrom is a Lecturer in the Department of Politics at the University of York. Nicole Lindstrom’s research interests lie in the political economy of public policy, with a particular focus on the European Union and new member states of Central and Eastern Europe. She is co-editor of Transnational Actors and Post-socialist Transitions (University of Pittsburgh Press), and author of articles in Governance, Journal of Common Market Studies, New Political Economy, among others. She was previously a member of the Departments of International Relations and European Studies and Political Science at Central European University in Budapest. The post dwells on the financials, but Slovenia’s strong civil society and high protest potential are also part of the story making it more Southern European than East European.